As a member of the Air & Expedited Motor Carrier Association, Crown will be exhibiting at the upcoming AirCargo Conference 2019 in Las Vegas, NV. Each year the AirCargo Conference brings together all players in the air cargo supply chain in one location to discuss trends, challenges, opportunities and the future of air cargo industry. Airlines, airport authorities, freight forwarders, truckers and expediting companies, along with the vendors who support them, are all in one place. Crown is proud to exhibit with this dynamic group. We hope to see you there! 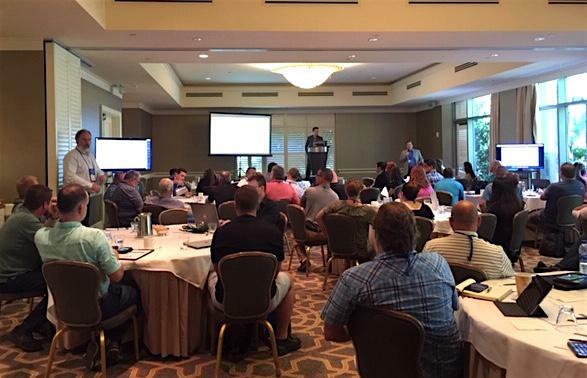 Crown held its second Users Conference last month in Atlanta. Long-term and new customers attended from all over the country to learn how to maximize their Crown systems and network with their peers. There are dozens of important items and details to consider when looking to purchase a software package for your air freight trucking company. Measuring the pros and cons of each software option can be overwhelming, leaving you up in the air as to which air freight software is going to be best for your business. So why should you choose Crown Data Systems? Having been in business for almost 20 years, Crown knows the ins and outs of the industry. In fact, our software package was initially designed for our owner’s own air freight trucking company – meaning we know exactly how your business works and what software solutions we can provide to help it run more efficiently. Need more convincing? Check out the top five reasons why you should trust your air freight trucking business to the software solutions provided by Crown Data Systems. We don’t wait for the issues to arise – we seek out the trends and begin developing solutions before products become outdated or redundant. By conducting regular check in’s with our customers, we can predict the direction our software developers should be heading. In this story, we’re going to look at two Air Freight trucking companies: ABC Logistics, and XYZ Cartage. Both companies use the Crown Freight Manager and Crown Document Manager systems. Both companies have been running the Crown software for 5 years and use Quickbooks server edition for their accounting software. ABC Logistics and XYZ Cartage run their systems on individual Windows Servers, which are maintained and updated by local IT contractors. Their networks are protected by firewalls and antivirus software and their CFM6 and Quickbooks databases are regularly backed up on the server. The difference between ABC Logistics and XYZ Cartage lies in their disaster recovery plans. Locally, ABC logistics backs up their databases and images to a separate hard drive within the server. This $50 upgrade creates redundancy and allows critical files to be recovered in the common event of a hard drive failure. ABC Logistics also uses a third party vendor to backup data over the Internet on a nightly basis. This service costs approximately $10 per month, but protects the company in the event of a total server failure or localized disaster. 2. The IT contractor for XYZ Cartage does not have a good disaster recovery plan. He has setup local backups and monitors them diligently. The contractor didn’t however, address the potential single point of failure and has left the company vulnerable to losing all of their data. For many years customers of Crown Data Systems have asked us for a User’s Conference style event. What did they want? An informative meeting spanning a couple of days that paints a vivid picture of Crown Data Systems, including past, present and future. A valuable networking opportunity to meet other professionals in the business that use our powerful software systems while being immersed in all things Crown. Training, tips, tricks and hints that will make better business owners, managers and operators. Now, the time is right! Our customer base is ever growing, our products line is increasing, and our dedicated staff is prepared to host the most valuable event for your business this year. Years of generating ideas have boiled down to months of planning and preparation, all leading up to the very first Crown Data Systems Users Conference, hosted February 28 through March 1, 2016. The User’s Conference will be hosted on the outskirts of Atlanta, Georgia at the beautiful Intercontinental Buckhead. Kicking off on Sunday night with a fabulous opening cocktail reception, guests will have the chance to meet and mingle over delicious food and drinks before getting down to business first thing on Monday morning. In August of 2015, the Crown Data Systems team took a trip to a small town in Western New York to take on one of the toughest events known to man. In the midst of fun runs, colorful 5K’s and beer miles, the Tough Mudder stands on its own. Twelve grueling miles with obstacles designed to train the British Special Forces, complete with electrocution, freezing waters and twelve foot walls. Did we mention that everything is covered in mud? Somewhere between the three hour car ride (including a one hour detour for misdirection – we should have used Crown Maps!) and mile twelve, the team came together to form cohesive, creative and strong relationships. The Tough Mudder required communication, teamwork and organization, all vital requirements your air freight trucking team must have to succeed.